I’m joining in on Summer Fest again this year, but I can hardly believe it’s summer. In some ways, it seems like I just moved back to Fresno, but as the temperatures recently started up into the hundreds, I had flashbacks to last year and realized that this is my second summer here. I’ve been back here, in the place where I grew up, for more than a year. Well, it’s definitely starting to feel like home again and I’m happy to be here. Although the summer heat can seem almost unbearable at times, there are plenty of reasons to put up with it. Living in the San Joaquin Valley definitely has its advantages and I think the amazing variety of local stone fruit is right up there on the top of the list. Unfortunately I missed the Organic Stone Fruit Jubilee this year, but I’ve been buying local organic peaches at my favorite farmer’s market and they’re really great this year. Since I’ve changed the way I’m eating, I probably won’t be eating a whole lot of peach cobbler or nectarine muffins this year, but I’ve been enjoying our local peaches just the same. Since cutting out sugar four months ago, raw fruit tastes so much better to me than it ever has before. A bowl of fresh berries or sliced peaches drizzled with heavy cream satisfies me just as much or even more than heavy, sugar-laden desserts ever did. Since fruit does contain lots of natural sugar, and I need to limit sugar in my diet to help control my reactive hypoglycemia, I still can’t go overboard on fresh fruit. For me, it’s become a special treat and I usually only eat a serving or two a day – either with breakfast or as a dessert after dinner. Lately I’ve really been enjoying a small smoothie made with fresh organic fruit and yogurt (or homemade kefir) first thing in the morning. I’ve found that I feel best if I eat something small as soon as I get out of bed and then eat a more substantial breakfast an hour or two later. My new favorite combination is fresh peach blended with Greek yogurt and ice. I know it’s simple, but the flavor is out of this world. Give it a try! 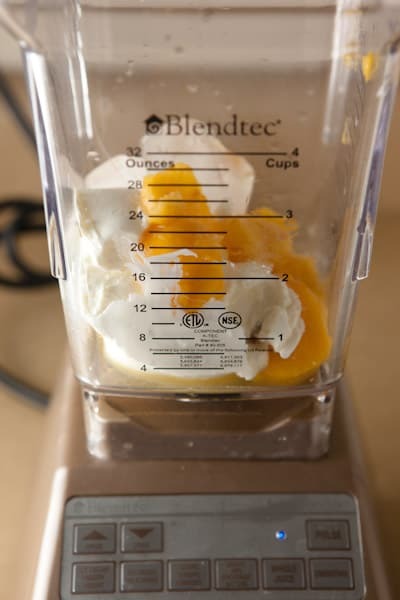 Place peach chunks and juice, yogurt, stevia, and ice cubes into a high-powered blender. Cover and blend until completely smooth. Enjoy! To join the Summer Fest conversation on twitter, use the hash tag #cookingwith. June 22: Eggplant – missed this one! Wonderful!! I love smoothies -- and this one sounds properly sweet and creamy. I can't wait to try it. For the last several years, I've been adding spinach to my smoothies, and find that the resulting drink resembles nothing more than the fruit part of the smoothie, which is great because you get the added boost of the spinach along with the fruit & yogurt. mmmmm. My husband is trying to cut carbs and up his protein, while I'm just trying to find foods that will provide better nutrition AND satiation. I eat a lot of Greek yogurt already, but this seems like the sort of thing I could blend up and take to work - and that would cut back on the creaminess of full-fat yogurt that can be quite overwhelming. I look forward to more low-sugar stuff from you! I have been wondering when you would come back to us! Sounds like you are doing really well on your new way of eating! I really hope that you start sharing more recipes of what you are actually eating these days. This smoothie sounds fabulous! We are up to our ears in peaches this time of year...and I can't wait to try this out! 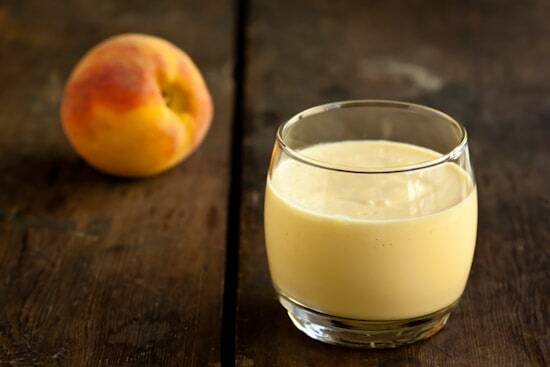 I have a peach smoothie recipe with yogurt, too! http://www.loveveggiesandyoga.com/2011/05/peach-banana-colada-smoothie.htmlYours looks awesome and love seeing ALL These peach recipes. I ADORE peaches!! I love to drink smoothies of all kinds especially during the summer and this looks wonderful! Mmmm... I love a good, simple smoothie recipe! Will have to try this one. Thanks for sharing!! I'm the same with breakfasts. I love starting the day with a tall glass of water, followed by a small smoothie 20 minutes later. Then I'll have a larger breakfast 2-3 hours later. It's so much better for me! I love a good smoothie recipe, thanks for sharing the idea! I love smoothies, and especially with Greek yogurt too. Another bonus: make it with frozen peaches and you'll have a yummy soft-serve frozen dessert. Thanks for the link love! Simple can be amazing! I make a similar smoothie, but use coconut milk instead of yogurt. Delicious. I am currently all gaga over Greek yogurt too. So I'm in. 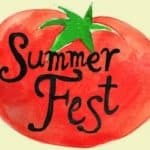 I so wish I had known about Summer fest before! This sounds wonderful and if you use frozen peaches that you have flash frozen you can omit the ice. You just get lots of flavor! I do this for a banana smoothie. Oh yum. I have been in a fruit-and-yogurt smoothie mood myself lately. Something about the hot weather makes you just crave a juicy, fruity drink. 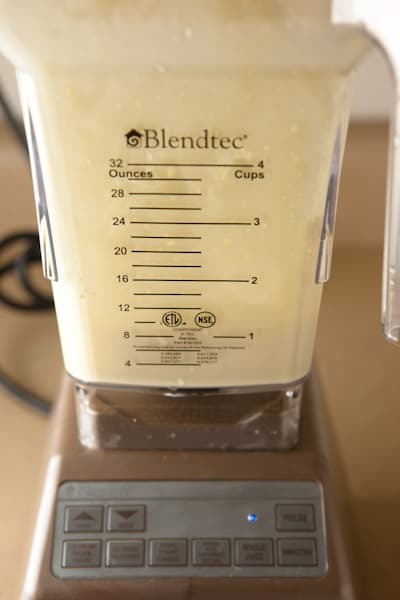 My latest favorite uses plain nonfat yogurt, half a banana, ice, frozen pineapple chunks, and a T. or two of cream of coconut . Deeee-licious. :) Thanks for sharing this. Smoothies are a big hit in my house, both as breakfasts and as a mid-afternoon snack. Not only are they healthy, but I can sort of trick myself into thinking I had a milkshake! Love this simple smoothie! Lots of protein in Greek yogurt! My fave! Nothing says summer to me like fresh peaches and the farmer's market. They remind me of my childhood, and I recently purchased some nectarines. Not the same, but close enough. And I am totally making this for myself tomorrow morning because it sounds like the perfect way to start off a morning. Thanks for sharing this! This looks great and I am sure that it tastes great too! I love yellow cling peaches in any format. The recipe looks simple enough. I don't know about your peaches, but ours are as sweet as can be. Had some for breakfast this morning and they were perfect. Your smoothie looks wonderful! Smoothies are so good in the hot summer! I just did one with bananas and almond milk that was so tasty. I think a peach smoothie will be tomorrow's breakfast of choice! Thanks for the inspiration! Looks amazing! I’ll have to try making this for the kids. I love making smoothies at home with fresh ingredients, and herbs too. I make them for a quick healthy meal when I don't feel like cooking. The possibilities are endless. I want to try to do Creamy Peach and Greek Yogurt Smoothie, hopefully I will be successful, it seems easy to make. Thank recipes from http://pinchmysalt.com. This was so good! I used a nectarine that wasn't super ripe and it was still amazing. Thanks! Yum. This looks so creamy and delicious.